Well! 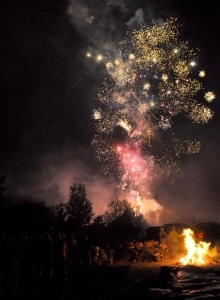 Saturday night’s bonfire party was an absolute stonker!! A massive thank you to everyone who came and brought their friends and family and helped us raise a whopping £1450, and a HUGE thank you to the Bishop Rd PTFA for organising the fireworks and a GIANT thank you to the volunteers who worked so hard chopping, cooking, baking, mulling, guy making, fire building and all the rest. Just brilliant. Here’s pic and you’ll just have imagine a crisp, cold, autumn night in the garden, the crescent moon low in the sky, mug of delicious soup in one hand, cup of scrumptious mulled apple juice in the other, lots of lovely folks and a great big bonfire. And sorry to bring up Christmas so soon after bonfire night but just a quick note to say wreath making will be back on the 3rd December so pop that on your calendar and tell all your friends! And to finish… the latest pic in our exotic veg range 2016… yacón! The jury is still out on the taste – it’s not “like an underground pear” as we were promised but it’s supposed to sweeten up and maybe then it’ll more like “a cross between watermelon and mild celery”…. This entry was posted in News from the Garden on November 17, 2016 by GHCG.